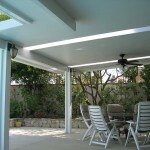 Insulated Patio Covers In Los Angeles & Orange County | Canopy Concepts, Inc. The 3” Elitewood insulated rood deck on our insulated patio covers have the same wood grain texture as our standard cover. 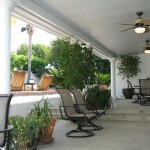 Your patio cover will have the appearance of a wooden cover without any of the maintenance and problems of wood. This quiet, walkable cover has an extra 3 inches of insulation to give you extra protection from the elements and extra durability to ensure that your patio cover lasts for years to come. Install lights or fans without a conduit thanks to invisible metal channels inside the roof panels. 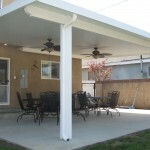 Creating the perfect insulated patio cover is a breeze with Canopy Concepts. Request a quote today!